As anyone bullied in school knows, it’s no fun to be around a bully or be the target of their bullying. Many beer fans don’t realize it but they’ve become the thing they hated in their early years. 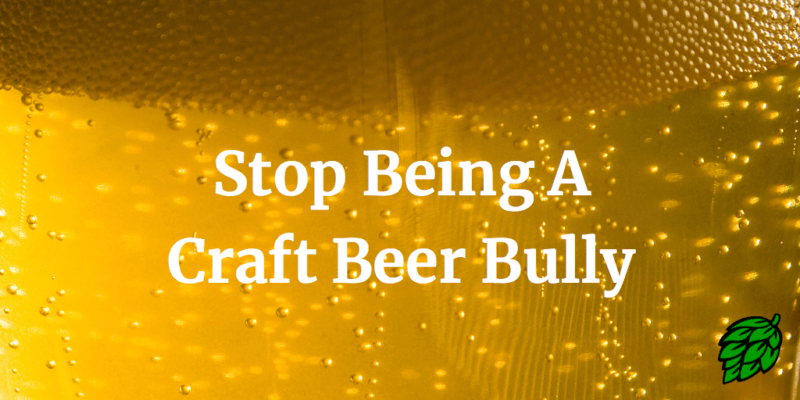 Are you a Craft Beer Bully? When craft was the new thing, we took some criticism from the big beer drinkers. They made fun of our high-priced, fancy craft beers. You’d go to a party and someone would always point out the fact that you’d brought your own beer because the stuff provided wasn’t good enough for your sophisticated tastes. Though times have changed, and craft beer has become an acceptable drink, that doesn’t mean the bullying has stopped. Instead, it’s simply switched sides. We’ve seen the rise of the Craft Beer Bully in recent years. These folks may never have known the time when you may have gotten a bit of light-hearted joking from macro-drinkers, but they take every opportunity to slam those folks on their drink choice. They’re constantly telling others why their choice of craft beer is better than the “swill” macro lager they choose to drink. It’s sad and this behavior needs to stop. It seems they’re either unaware or don’t remember how we felt when others criticized us for our beer choice. Everyone should be free to choose what they want to drink (be it macro or craft), without judgement from others. You may not like tomatoes or squid, but that doesn’t give others a right to make fun of you for it. Why should beer choice be any different? We’re trying to raise the profile of craft beer as a whole, and the Craft Beer Bully does nothing but make all craft beer fans look like assholes. We need to stop them (and stop ourselves if we find we’re slamming others for their beer choice). Belittling others for their choice of drink is wrong and does nothing to make craft beer or the culture appealing to those we hope to convert. We don’t need more comments about how macro lager is just water. We’ve heard them all before and it doesn’t make you look funny or intelligent. Please, just stop. If we hope to continue to show others the wonderful appeal of craft beer, we need to be good ambassadors. This means not judging people for their choices in brew, but showing them there are more options than just the standard Big Beer most are use to drinking. The Craft Beer Bully destroys any chance of appealing to those we look to show the light. They need to be stopped.